Could Rockman 9 start a 'retro revolution?' The return to the more simplistic style of games? Creator of the Castlevania series, Koji Igarashi believes so. Igarashi is watching the success of Rockman 9 closely to determin if the next iteration in the Castlevania series would return to its 2D roots. "I’m watching that very closely to see how it does. Myself, I’m a big retro gaming fan, so if it is successful that definitely opens up doors for what I can do." 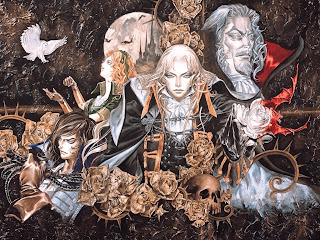 Like the Rockman series, releasing a new 2D Castlevania title is risky, financially. If a new 2D Castlvania were to be made, it would follow the path of RM9, a downloadable title possibly in 8- bit. What would be crazy is to see an 8-bit castlevania in the more recent metroidvania style of gameplay. I classic castlevania game would be welcome as well though! We have games like Halo for flashy and great graphics. Um, I thought all the DS CastleVania's are 2d and they are selling more then most series out there. I don't see where another would make less money. However I would love to see more SoTN style infull 2d instead of the 8bit/16bit roots. I think they're talking more like NES style, at least that's what I gathered.